MIT Media Lab and Microsoft Research together, are working on a ‘smart’ tattoo that remotely controls your phone. Using DuoSkin, MIT Media Lab and Microsoft Research created on-skin input elements that resemble traditional user interfaces, such as buttons, sliders, and 2D trackpads. Technology is certainly advancing at an unimaginably fast pace and each time it is, characteristics of each situation is being reversed. The age of automation or the age of ‘do it yourself’ is being taken to the next level with MIT Media Lab and Microsoft Research’s latest experiment. 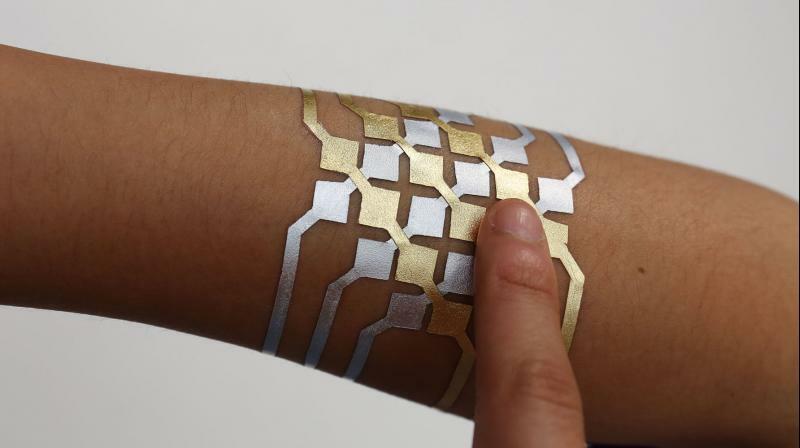 Their new project called ‘Duo Skin’ which is being developed at Massachusetts Institute of Technology, combines embedded sensors and gold leaf into connective elements that act as interactive temporary tattoos. As described on MIT’s website, Duo Skin is a fabrication process that enables anyone to create customized functional devices that can be attached directly on their skin. It draws aesthetics found in metallic jewellery-like temporary tattoos to create on-skin devices. DuoSkin metal leaf traces serve both, decorative and functional purposes, this LED necklace is an example of jewelry-like routing made with DuoSkin. The development of DuoSkin involves a three-step workflow wherein, they start with sketching skin circuitry and graphic design software followed by fabrication of the same. After which, they create stencils of the circuitry and apply gold leaf as the conductive material. After completing circuitry, they then apply the Duo Skin device to the user’s skin through water-transfer. They have demonstrated three types of on-skin interfaces: sensing touch input, displaying output and wireless communication. It enables users to control their mobile devices, display information and store information on their skin while serving as a statement of personal style. "We believe that in the future, on-skin electronics will no longer be black-boxed and mystified; instead, they will converge towards the user friendliness, extensibility, and aesthetics of body decorations, forming a DuoSkin integrated to the extent that it has seemingly disappeared," reads a video description for DuoSkin.